SALT LAKE CITY – After a second-half collapse Friday night, Dixie State must have been having deja vu against NAIA Dickinson State Saturday. The Blue Hawks, out of North Dakota, rallied from 10 down to pull within a single point late in the game, but this time Trailblazer Trevor Hill made sure there would be no repeat. 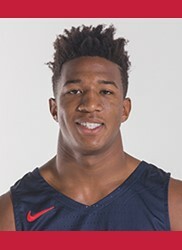 Hill put the team on his back and kept the Blue Hawks at bay with some needed buckets and Dixie State weathered the comeback and eventually put some distance between the two teams before winning 83-73 at Behnken Field House on Westminster University Campus. The Trailblazers maintained an eight-point lead through the first four minutes of the second half. Hill’s steal and layup put Dixie State up 44-36 with 16:53 remaining. In less than a minute, however, Dickinson had pulled to within one. A turnover and a charge led to the Blue Hawks’ extra possessions. Hill broke the run with a drive to the basket to put DSU up 46-43. The Blue Hawks would score again to tighten things, but that would be as close as they would get. Hill’s jumper in the lane ignited a DSU 9-2 run. Dub Price’s two free throws had the Blazers up 55-47 heading into the second media timeout of the second half. Brandon Simister hit a 3-pointer with 8:19 remaining to put the Blazers up 61-51. Moments later, DSU had its largest lead of the evening when Austin Montgomery hit two from the charity stripe to put the Blazers up 67-54 with 6:16 remaining. The Blue Hawks did pull within six, 77-71, on a three-point play with just under two minutes left. But then they were forced to play the fouling game and Dixie State hit its final six free throws of the night. The teams played evenly through the first eight minutes of the game. Simister’s 3-pointer at the 12:37 mark tied the game at 16-16. The Blazer defense then went into overdrive, holding Dickinson State scoreless over the next five minutes. DSU outscored the Blue Hawks 11-0. Price scored four points during the span. 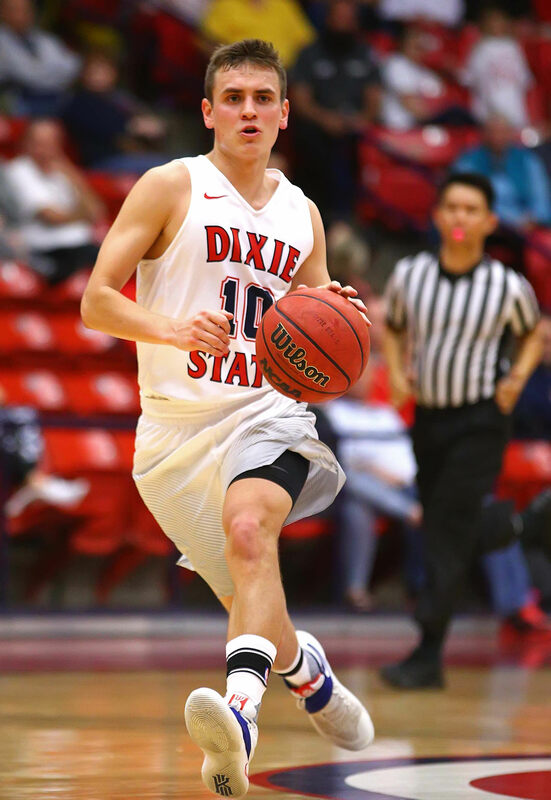 Wade Miller’s 3-pointer with seven minutes remaining in the first half gave Dixie State a 24-16 lead. The lead grew to 12 when Isaiah Clark converted on a three-point play with 1:26 remaining in the half, 36-24. The Blue Hawks scored two buckets from distance before Julien Decree scored the final two points of the half to give Dixie State a 38-30 halftime advantage. At halftime, the Blazers held a 38-35 percentage advantage from the floor, including outshooting Dickinson State 39-29 percent from the arc. They also held a 24-17 rebound advantage. Individually, Simister and Miller led the way with six points apiece, with all of their points on 3-pointers. Miller also had five rebounds at the break. While the final stats reflect the Blue Hawks outscoring Dixie State from the floor, the Blazers countered that with 14 more points from the free-throw line. They connected on 30 of 36 for an 83-percent clip. They also hit 32 percent from beyond the 3-point line. DSU outrebounded Dickinson State 43-31. Individually, Hill led four players in double-figure scoring with 16. He was followed by Simister (13), Zac Hunter (12) and Miller (11). Hill and Hunter also shared team honors with Price in rebounds with seven apiece.